We came to Wildwood Crest to celebrate my mother’s 90th birthday at the Jersey shore where she spent summers growing up. There were 4 of us and this location was perfect. Three bedrooms and three full bathrooms. The owner advised me of the stairs and the fact that there was no elevator but this was not a problem for us. The pictures of the condo are very accurate. The condo was very clean although the building common hallways were worn and showing age. The beds are very comfortable. While towels are not included in the rental, sheets were. You were however expected to wash them before you left so it was an early morning two loads of laundry. Laundry soap was not provided to do this so we had to buy our own. I think in hindsight the extra charge for not washing the sheets would have been simpler. The beach area was very accessible and not crowded at all during the week this time of year. The area around the condo is very residential and quiet although there are plenty of restaurants within walking distance. We used the common area gas grill one night to cook hamburgers and it was fun to eat on the deck listening to the ocean. Beautiful ocean views and a nice pool. Spacious and comfortable. Appliances were top of the line and TV's were huge. Deck was a favorite place. Nicely appointed condo in Ocean Sands. Ocean front! Only negative thing was no umbrella on the deck which prohibited us from spending more time there to enjoy sunrise, eat dinner etc. Otherwise, really nice place. The owner was easy to deal with as well. Thank you for your review and feedback. The reason for not offering the deck umbrella is if the guest forgets to close the umbrella it would cause significant damage to the property. The deck is on the top floor of an ocean front property and the umbrella can be a flying projectile causing injury as well. This is the second time we've stayed at this property, and enjoyed it very much. The location can't be beat, the proximity to and views of the beach are great, and having the pool and use of bbq is a big plus. It's a very nice low-rise property in the midst of the hi-rises, and it's a short drive to the activity on the boardwalk. 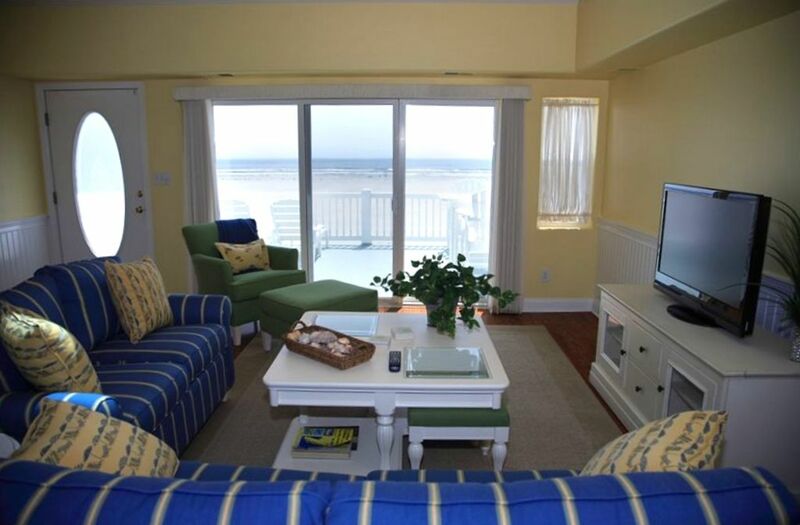 This is a beautiful condo, located right on the beach! You can relax on the deck and look at the ocean, morning, noon and night! The walk to the beach is short, and easy. The pool located at the condo unit is very nice, and rarely crowded. The condo itself is very clean, and is ideal for families traveling together. Our families will be returning for years to come! We stayed their for the first time this summer, and Shreya's condo was even better than pictured. It was so spacious and very easily fit our 2 families very comfortably with room to spare. It was very clean and we didn't want to leave! The proximity to the beach is a stone's throw, and the property's pool was a wonderful way to end our days. We look forward to many return visits.